Michael Jefferson Bulger, planter, planter, brigadier general, C. S. Army, State senator, was born February 13, 1806, in Richland District, S. C., and died September 11, 1900, in Tallapoosa County; son of Pierce and Sarah A. (Adam) Bulger, of Richland District, S. C., the former a mechanic by trade, a soldier in the War of 1812, in which he was wounded, and a resident there until his death in 1815; grandson of Michael Bulger, a native of Ireland who came to America during the Revolution as a member of General DeKalb’s staff, was in the battle of Camden, where DeKalb was killed and he himself left wounded on the field, recovering, he married, and settled in Richland District where he reared a family. When seventeen years of age General Bulger, with his brother Charles, located in Montgomery, where he was apprenticed to a gin-maker with whom he lived several years. In 1834 he removed to Nixburg, Coosa County, and thence in 1838, he moved to Tallapoosa County and followed the occupation of a planter the remainder of his life. He was elected to the State legislature, 1851-57. He had a fine understanding of parliamentary law, especially that part which was of use to a minority. He was elected brigadier-general of militia and held that position until 1861. During the years he held this office he labored diligently to infuse and maintain a military spirit among the people. 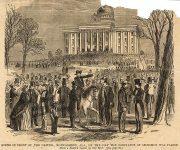 He was a delegate to the Charleston convention of 1860, but withdrew with the Alabama delegation and took no further part in the proceedings, except that of an onlooker, deeply interested in final results. In the division of the Democratic party, he adhered to the national organization, canvassed the State extensively for Douglas and was a candidate for election on the Douglas electoral ticket. Upon the call for a convention, following Lincoln’s election to the presidency of the United States, General Bulger was elected from Tallapoosa to that body, and opposed the secession of Alabama from the Union on the grounds that it was “unwise and impolitic,” and urged steps looking to co-operation with the other slave-holding states. When the ordinance of secession was reported by the committee of thirteen, he voted for a proposition to submit it to the people, being one of three men who refused to sign the ordinance. A mob formed and threatened to hang him for what they regarded as disloyalty to the section, but upon hearing his defiant retort that according to his opinion a man who refused to vote according to the wishes of his constituents deserved to be hanged, and that they should come and do their work, the mob became an orderly mass that entered the hall to stare at a man with so much courage He remained in the convention throughout the whole session, taking part in its proceedings and assisted in the re-organization of the State government under the new order of things. In 1861 he was defeated for the Senate. When war came General Bulger felt it his duty to do everything to uphold the Southern cause. His first work was to assist Governor Shorter to re-organize the cavalry. He recruited and organized a company and went into camp at Loachapoka, and with his assistance a regiment was raised, but on his failure to be elected colonel he accepted a captaincy in the 47th Alabama infantry regiment; at the battle of Cedar Run he was in command of the regiment and during an attack on the flank he was wounded in the arm, but he bound his arm tightly, laid it in his bosom, and continued to command his regiment. A little later he was shot in the leg and an artery severed, but he stopped the flow of blood by placing a corncob on each side which he bound with a suspender that was given him by one of the soldiers, and then persisted in the fight until exhausted from the loss of blood he was compelled to desist. He was borne to the home of a Mr. Tusby where he was cared for. He returned home and while confined to his bed from his wounds he was elected to the State Senate to fill a vacancy. His last residence was Jackson’s Gap.